As part of Björk’s Biophilia project, Björk has released a music album, an app album, and a traditional music video. I have been anxiously awaiting the arrival of the live tour, the culmination of the project, and was lucky enough to see her performance Monday night, as well as the educational exhibit at the New York Hall of Science. The New York Hall of Science was the perfect setting for the concert and exhibit. It is primarily a hands-on science center for kids, helping them understand and enjoy science and technology through participation. The initial installation in Reykjavik was so successful, traveling workshops are being developed to visit every public school. For the New York City residency, Björk collaborated with the New York Hall of Science and The Creators Project to tailor the Biophilia education program for the Museum’s layout. 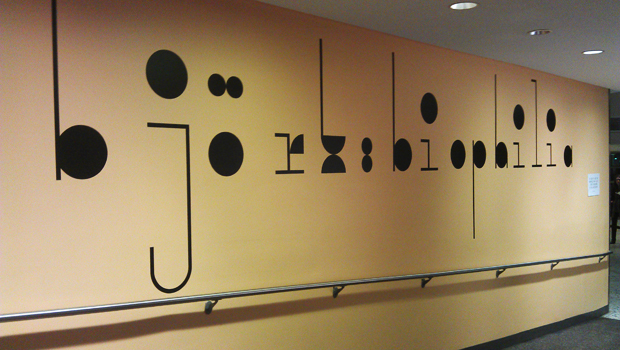 Scattered throughout the two floors were Biophilia-specific stands. A screen displaying the rolling graphic score of a song sat above a sign that explained the scientific significance of the song, and how it inspired the exhibit surrounding it. 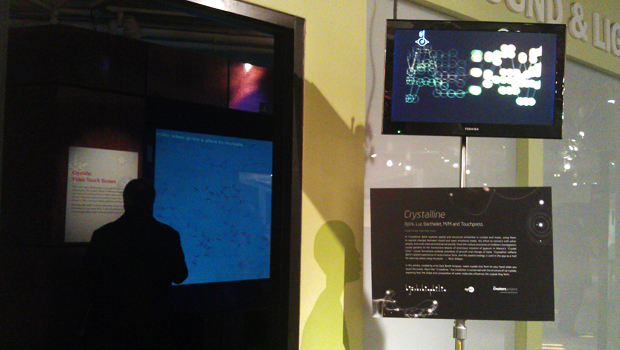 The most interesting display was “Crystalline,” a song about the beauty of crystals. 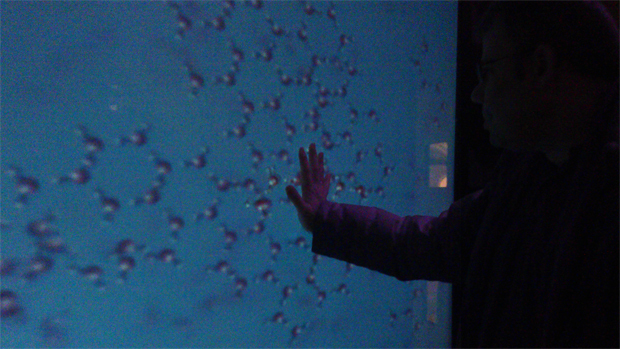 The sign encouraged visitors to place their hand on a large screen, upon which crystals would slowly build around one’s hand. This was not only evocative of the song, but also of the “Crystalline” app, a game that involved the user building up a cluster of crystals. The ability of the displays to further build on the messages of the songs is exciting and effective. But Björk et al took it to another step, by unifying the songs and apps in a physical space, acting as an anchor for the connections between the different extensions. As someone who was familiar with the music and had used the app album, this was very validating. Overall, I was a little underwhelmed by the exhibit, but by no real fault of its own. It was clearly spread out for kids to find and explore, so it wasn’t really built for the likes of me. It was, however, unclear if all the hands-on components were created specifically for this show or if they were already there and merely matched up with a suitable app. Some of the pieces showed a fair amount of wear and tear, certainly more than one would expect in just a week. I had seen a video of Thunderbolt live, as well as Björk’s performance on The Colbert Report, but it did not prepare me for the beauty and quality of this show. The concert was held in NYSCI’s original building, the Great Hall, designed for the 1964/1965 World’s Fair. Its wavy blue Dalle de Verre glass walls are astonishing in person, apparently designed to give the illusion of being in space. It was a perfect fit for the science-themed show. The stage was designed for an in-the-round performance, with standing and seated areas bordering each side of the platform. Throughout the performance, Björk and the choir would move from one side to the next, generally giving all sections of the audience an equal amount of time. This created a very intimate and special setting. The localization aspect, knowledge that the performance and stage design was specifically tailored to the venue and city, added extra emotional resonance and a sense of exclusivity of the experience. Over the stage hung a ring of large flat screens, that displayed some type of video for most of the concert. During almost all of the Biophilia songs, the appropriate app was played for the duration of the piece. (David Attenborough’s narration from the app album was also used to introduce the concert and individual songs.) This marriage of the app with the live performance reiterated the connection of the app to the song by adding another relationship within the transmedia campaign: content moving from the song to the app, and from the app to the live performance. When an app wasn’t available or visually engaging enough, footage from the BBC natural history archive was used. 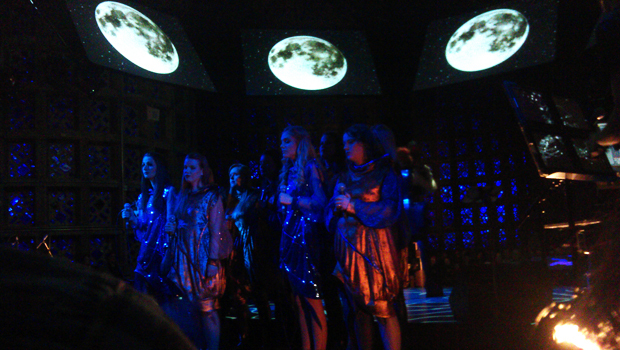 The Icelandic women’s choir wore brightly colored sparkly outfits, appearing both geological and celestial. Their movements were often choreographed to support the music: they scattered around like crystals during “Crystalline,” and crouched in the middle during “Mutual Core,” exploding up and out at the end like the lava eruption mentioned in the lyrics. Perhaps the most exciting aspect of the live performance as a platform was the use of special instruments designed for the album and/or tour. I had heard about these instruments, but it was quite another thing to see them used live. Pipe organ and gameleste – Two traditional instruments were modified to fit the music’s need. The pipe organ was custom-built to not only travel easily, but be midi-controlled from afar. 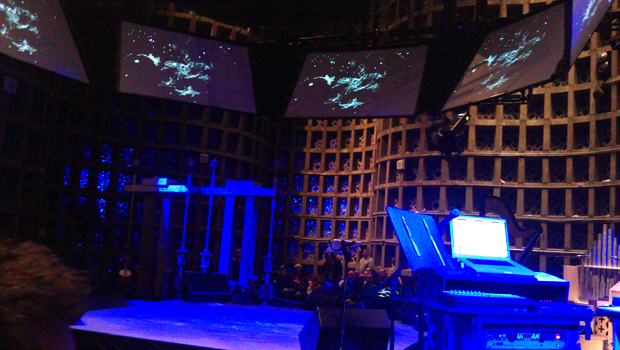 During “Dark Matter,” Björk used an iPad to play the organ live while standing a number of feet away from it. The gameleste is an automated gamelan-sounding celeste, housed in an open wooden box, that is played by a computer program. iPad and Reactable – One of the main app developers, Max Weisel, also played on stage, using interesting touch-screen devices as instruments. This included a sheet of four iPads as drum pads, and a Reactable table, which allows the musician to use blocks to create and manipulate sound. While all of these instruments are very different, they constantly harkened back to Björk’s messages about the relationships between humans, nature, and technology. The gravity harp is reliant on the natural phenomenon to create music. The pipe organ and gameleste were modified with new technology to make them easier for human interaction. The Tesla coil demonstrates how science can directly translate into music. And, of course, the iPad further illustrates how technology can make music production more accessible to the general public. The live performance of Biophilia is a tremendous feat, a truly integrated production that called out not only to other extensions, but made the themes of the music stronger and more emotionally resonant. 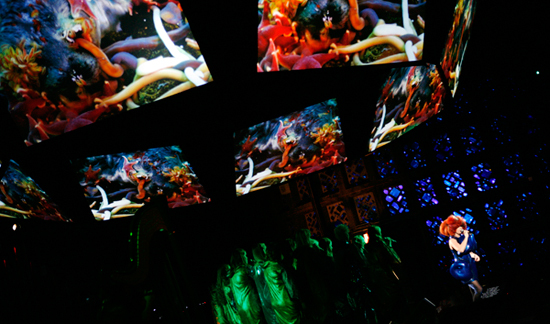 Thematically integrating the costumes, hardware, and stage design brought the attendee into the world of Biophilia. But more importantly, it tied together a model which other transmedia campaigns should follow. Some imagine transmedia properties as a sun, with a driving platform at the center and rays of extensions shining outward, but moving farther and farther away from each other. Biophilia is like a cobweb. A spider acts as the center as well, but it has spun individual threads that cross over and support each other to create a larger whole. Single strands, such as the apps and the live performance, can connect and inform each other without the spider, the music album, needing to be present. In fact, the web simply cannot exist without these connections. These relationships within the greater property strengthen the individual extensions, reiterate the larger messages, and expand the universe as a whole. Biophilia is truly a successful transmedia music property, one that I hope many musicians will emulate in the future.